That Your Crafts Are There? With Craft Fair Goldmine You Can Increase Your Craft Sales Greatly. Because We Can Show You How! Craft shows are everywhere in nearly every town at one time or another. Perhaps these shows are attached to town festivals. Perhaps the festivals themselves are what make the town famous. Either way, these shows are money-making possibilities for the serious crafter. It’s a huge step when you decide to take a hobby to the next level and start trying to make money off of it. It’s scary, it’s difficult, but it can be so very rewarding. The key to making your crafting business a success is being prepared and armed with information. You have to know what you’re doing before you can start. 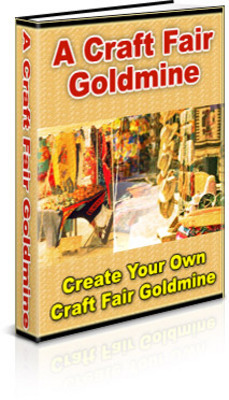 That’s why I’m offering you this wonderful book, “Craft Fair Goldmine” to help you along the way! This is more than just a guidebook, it’s a training manual designed especially for you – the beginning craft business. And those are just a few reasons why you should take the time to not only read this book, but also put it’s valuable suggestions to work in your life right now! If you’re a crafter who’s thinking about taking this step, we know who you are! You’ve been crafting for years. Your friends and relatives are thrilled when they receive a gift you’ve made yourself. Your co-workers ask if you can make them one of your custom crafts for a gift. They even offer to pay you for it! Everyone comments about how unique and well-made your creations are. Someone, at some time has said “You should sell these”. Then you begin to think, “Maybe I should sell these!” An idea has been born. You start to ponder the possibility, but you realize that without a steady paycheck, you’re more than scared. It’s alright! You don’t have to be scared. Not when you order “Craft Fair Goldmine”. These are just a few of the topics we cover – and there’s so much more inside the pages of this amazing book! We’ve taken all the best advice from crafters who have made a success out of their home business and put it all in this book. “Craft Fair Goldmine” contains some of the best advice around to help you put your fears aside and become the success you know you can be! There are many others out there doing what you want to do! Don’t let them have all your business! Learn What You Need To Know – With This Incredible Book! For just $25.00, you can share in what all the other crafting business’ know. The difference is that I am offering this to you in a easy to read guide that addresses your fears, your questions, and your problems. When you order now, you’ll receive this book within minutes, and it’ll be ALL YOURS! You can refer to it anytime you have a question about your business. Read it at 3 a.m. or at 3 p.m. It won’t matter, it’s all yours. Order now and get the answers you need and that you want. A Craft Fair Goldmine: Sell your Handcrafted Items craft fair;sell your crafts 132323426 21.97 tablaqueen Fresh Download Available!